See the follow up post where I introduce my R package and spreadsheet TOSTER to perform TOST equivalence tests, and link to a practical primer on this topic. 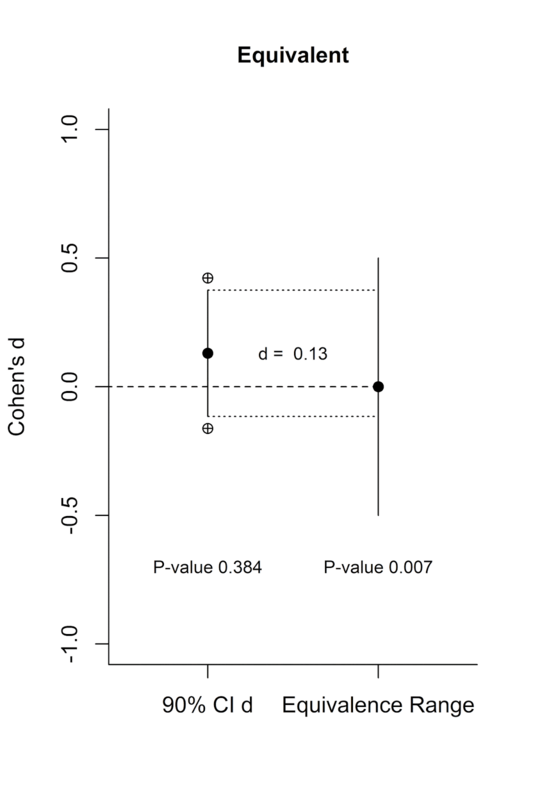 When you find p > 0.05, you did not observe surprising data, assuming there is no true effect. 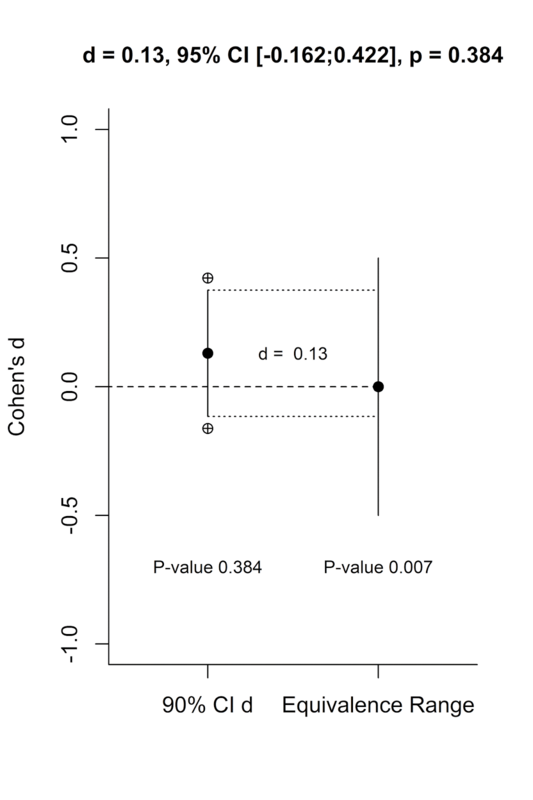 You can often read in the literature how p > 0.05 is interpreted as ‘no effect’ but due to a lack of power the data might not be surprising if there was an effect. 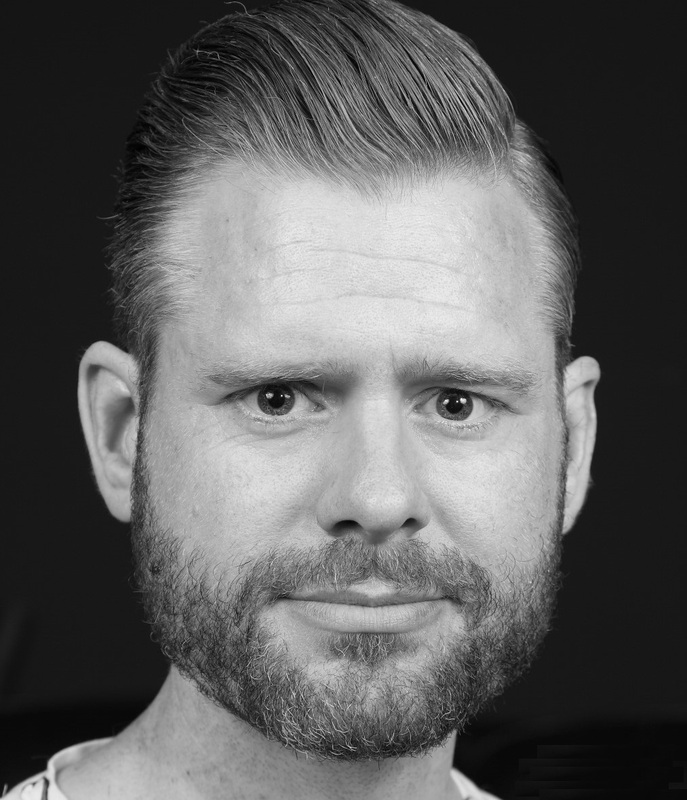 In this blog I’ll explain how to test for equivalence, or the lack of a meaningful effect, using equivalence hypothesis testing. I’ve created easy to use R functions that allow you to perform equivalence hypothesis tests. Warning: If you read beyond this paragraph, you will never again be able to write “as predicted, the interaction revealed there was an effect for participants in the experimental condition (p < 0.05) but there was no effect in the control condition (F < 1).” If you prefer the veil of ignorance, here’s a nice site with cute baby animals to spend the next 9 minutes on instead. Any science that wants to be taken seriously needs to be able to provide support for the null-hypothesis. I often see people switching over from Frequentist statistics when effects are significant, to the use of Bayes Factors to be able to provide support for the null hypothesis. But it is possible to test if there is a lack of an effect using p-values (why no one ever told me this in the 11 years I worked in science is beyond me). It’s as easy as doing a t-test, or more precisely, as doing two t-tests. The practice of Equivalence Hypothesis Testing (EHT) is used in medicine, for example to test whether a new cheaper drug isn’t worse (or better) than the existing more expensive option. A very simple EHT approach is the ‘two-one-sided t-tests’ (TOST) procedure (Schuirmann, 1987). Its simplicity makes it wonderfully easy to use. The basic idea of the test is to flip things around: In Equivalence Hypothesis Testing the null hypothesis is that there is a true effect larger than a Smallest Effect Size of Interest (SESOI; Lakens, 2014). That’s right – the null-hypothesis is now that there IS an effect, and we are going to try to reject it (with a p < 0.05). The alternative hypothesis is that the effect is smaller than a SESOI, anywhere in the equivalence range - any effect you think is too small to matter, or too small to feasibly examine. For example, a Cohen’s d of 0.5 is a medium effect, so you might set d = 0.5 as your SESOI, and the equivalence range goes from d = -0.5 to d = 0.5 In the TOST procedure, you first decide upon your SESOI: anything smaller than your smallest effect size of interest is considered smaller than small, and will allow you to reject the null-hypothesis that there is a true effect. You perform two t-tests, one testing if the effect is smaller than the upper bound of the equivalence range, and one testing whether the effect is larger than the lower bound of the equivalence range. Yes, it’s that simple. Let’s visualize this. 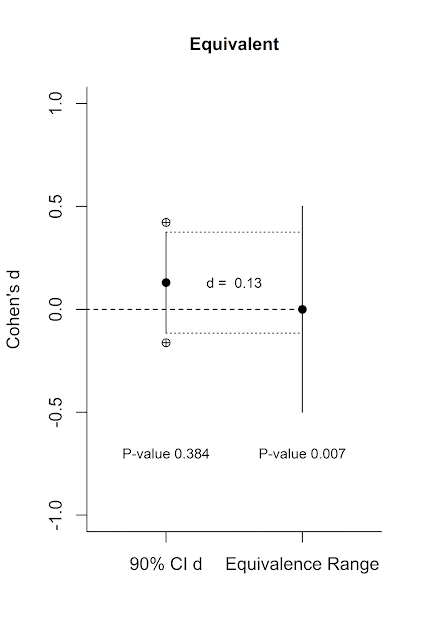 Below on the left axis is a scale for the effect size measure Cohen’s d. On the left is a single 90% confidence interval (the crossed circles indicate the endpoints of the 95% confidence interval) with an effect size of d = 0.13. On the right is the equivalence range. It is centered on 0, and ranges from d = -0.5 to d = 0.5. We see from the 95% confidence interval around d = 0.13 (again, the endpoints of which are indicated by the crossed circles) that the lower bound overlaps with 0. 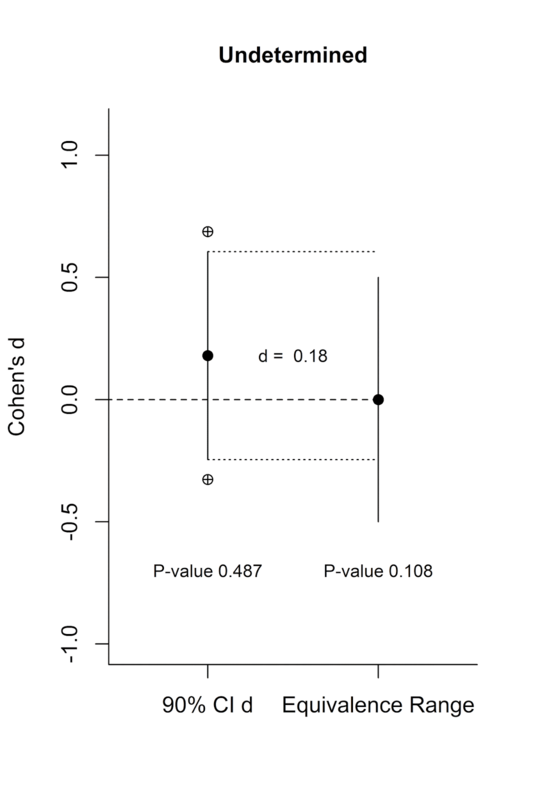 This means the effect (d = 0.13, from an independent t-test with two conditions of 90 participants each) is not statistically different from 0 at an alpha of 5%, and the p-value of the normal NHST is 0.384 (the title provides the exact numbers for the 95% CI around the effect size). But is this effect statistically smaller than my smallest effect size of interest? There are two ways to test the lack of a meaningful effect that yield the same result. The first is to perform two one sided t-tests, testing the observed effect size against the ‘null’ of your SESOI (0.5 and -0.5). 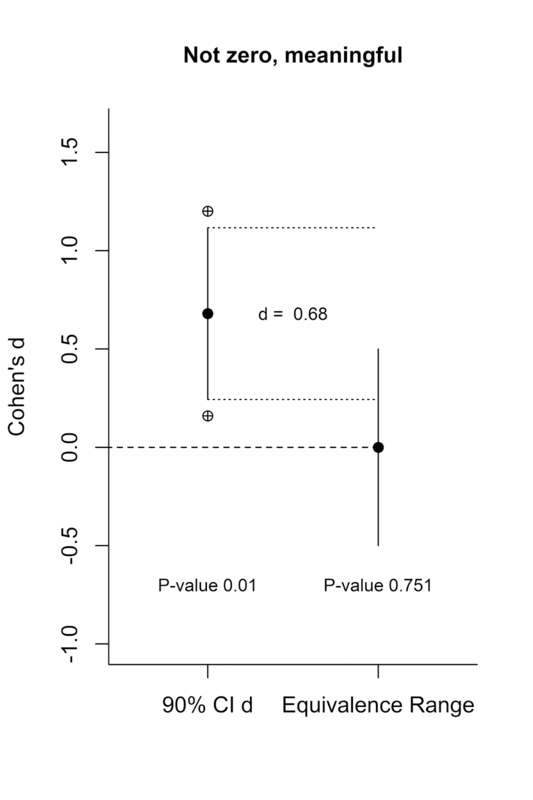 These t-tests show the d = 0.13 is significantly larger than d = -0.5, and significantly smaller than d = 0.5. 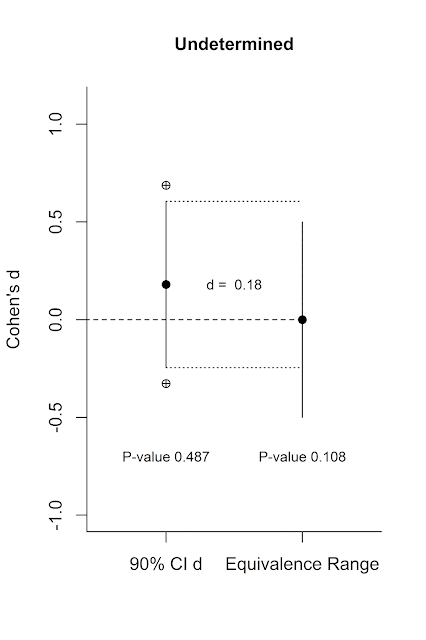 The highest of these two p-values is p = 0.007. We can conclude that there is support for the lack of a meaningful effect (where meaningful is defined by your choice of the SESOI). The second approach (which is easier to visualize) is to calculate a 90% CI around the effect (indicated by the vertical line in the figure), and check whether this 90% CI falls completely within the equivalence range. You can see a line from the upper and lower limit of the 90% CI around d = 0.13 on the left to the equivalence range on the right, and the 90% CI is completely contained within the equivalence range. This means we can reject the null of an effect that is larger than d = 0.5 or smaller than d = -0.5 and conclude this effect is smaller than what we find meaningful (and you’ll be right 95% of the time, in the long run). [Technical note: The reason we are using a 90% confidence interval, and not a 95% confidence interval, is because the two one-sided tests are completely dependent. You could actually just perform one test, if the effect size is positive against the upper bound of the equivalence range, and if the effect size is negative against the lower bound of the equivalence range. If this one test is significant, so is the other. Therefore, we can use a 90% confidence interval, even though we perform two one-sided tests. This is also why the crossed circles are used to mark the 95% CI.]. So why were we not using these tests in the psychological literature? It’s the same old, same old. Your statistics teacher didn’t tell you about them. SPSS doesn’t allow you to do an equivalence test. Your editors and reviewers were always OK with your statements such as “as predicted, the interaction revealed there was an effect for participants in the experimental condition (p < 0.05) but there was no effect in the control condition (F < 1).” Well, I just ruined that for you. Absence of evidence is not evidence of absence! We can’t use p > 0.05 as evidence of a lack of an effect. You can switch to Bayesian statistics if you want to support the null, but the default priors are only useful of in research areas where very large effects are examined (e.g., some areas of cognitive psychology), and are not appropriate for most other areas in psychology, so you will have to be able to quantify your prior belief yourself. You can teach yourself how, but there might be researchers who prefer to provide support for the lack of an effect within a Frequentist framework. Given that most people think about the effect size they expect when designing their study, defining the SESOI at this moment is straightforward. After choosing the SESOI, you can even design your study to have sufficient power to reject the presence of a meaningful effect. Controlling your error rates is thus straightforward in equivalence hypothesis tests, while it is not that easy in Bayesian statistics (although it can be done through simulations). One thing I noticed while reading this literature is that TOST procedures, and power analyses for TOST, are not created to match the way psychologists design studies and think about meaningful effects. 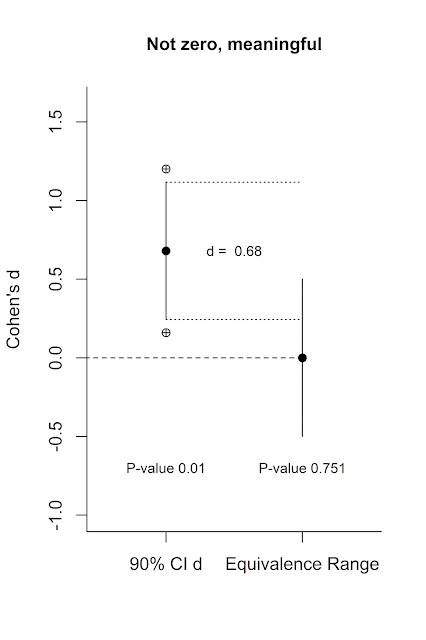 In medicine, equivalence is based on the raw data (a decrease of 10% compared to the default medicine), while we are more used to think in terms of standardized effect sizes (correlations or Cohen’s d). Biostatisticians are fine with estimating the pooled standard deviation for a future study when performing power analysis for TOST, but psychologists use standardized effect sizes to perform power analyses. Finally, the packages that exist in R (e.g., equivalence) or the software that does equivalence hypothesis tests (e.g., Minitab, which has TOST for t-tests, but not correlations) requires that you use the raw data. In my experience (Lakens, 2013) researchers find it easier to use their own preferred software to handle their data, and then calculate additional statistics not provided by the software they use by typing in summary statistics in a spreadsheet (means, standard deviations, and sample sizes per condition). So my functions don’t require access to the raw data (which is good for reviewers as well). Finally, the functions make a nice picture such as the one above so you can see what you are doing. I created R functions for TOST for independent t-tests, paired samples t-tests, and correlations, where you can set the equivalence thresholds using Cohen’s d, Cohen’s dz, and r. I adapted the equation for power analysis to be based on d, and I created the equation for power analyses for a paired-sample t-test from scratch because I couldn’t find it in the literature. If it is not obvious: None of this is peer-reviewed (yet), and you should use it at your own risk. I checked the independent andpaired t-test formulas against theresults from Minitab software and reproduced examples in the literature, and checked the power analyses against simulations, and all yielded the expected results, so that’s comforting. On the other hand, I had never heard of equivalence testing until 9 days ago (thanks 'Bum Deggy'), so that’s less comforting I guess. Send me an email if you want to use these formulas for anything serious like a publication. If you find a mistake or misbehaving functions, let me know. 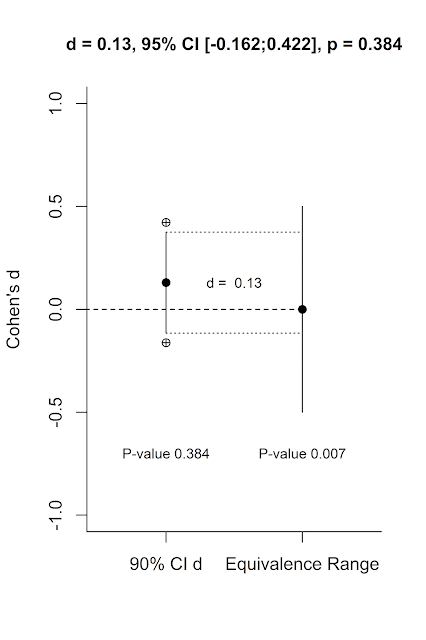 You’ll get the figure above, and it calculates Cohen’s d and the 95% CI around the effect size for free. You are welcome. Note that TOST and TOSTd differ slightly (TOST relies on the t-distribution, TOSTd on the z-distribution). If possible, use TOST – but TOSTd (and especially TOSTdpaired) will be very useful for readers of the scientific literature who want quickly check the claim that there is a lack of effect when means or standard deviations are not available. If you prefer to set the equivalence in raw difference scores (e.g., 10% of the mean in the control condition, as is common in medicine) you can use the TOSTraw function. 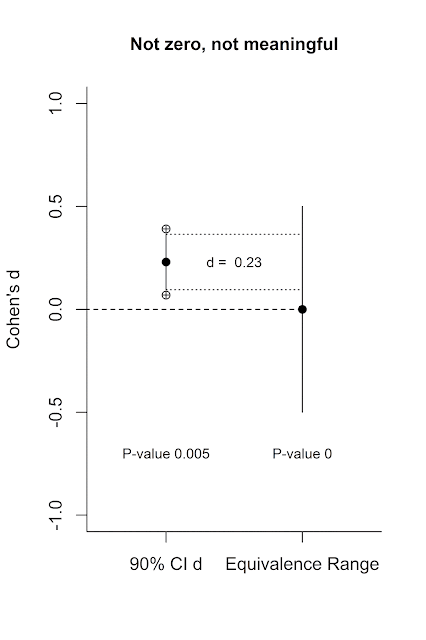 You will see you need 107 participants in each condition to have 80% power to reject an effect larger than d = 0.4, and accept the null (or an effect smaller than your smallest effect size of interest). Note that this function is based on the z-distribution, it does not use the iterative approach based on the t-distribution that would make it exact – so it is an approximation but should work well enough in practice. TOSTr will perform these calculations for correlations, and TOSTdpaired will allow you to use Cohen’s dz to perform these calculations for within designs. powerTOSTpaired can be used when designing within subject design studies well-powered to test if data is in line with the lack of a meaningful effect. In applied research, practical limitations of the SESOI can often be determined on the basis of a cost–benefit analysis. For example, if an intervention costs more money than it saves, the effect size is too small to be of practical significance. In theoretical research, the SESOI might be determined by a theoretical model that is detailed enough to make falsifiable predictions about the hypothesized size of effects. Such theoretical models are rare, and therefore, researchers often state that they are interested in any effect size that is reliably different from zero. Even so, because you can only reliably examine an effect that your study is adequately powered to observe, researchers are always limited by the practical limitation of the number of participants that are willing to participate in their experiment or the number of observations they have the resources to collect. Let’s say you collect 50 participants in two independent conditions, and plan to do a t-test with an alpha of 0.05. You have 80% power to detect an effect with a Cohen’s d of 0.57. To have 80% power to reject an effect of d = 0.57 or larger in TOST you would need 66 participants in each condition. Let’s say your SESOI is actually d = 0.35. To have 80% power in TOST you would need 169 participants in each condition (you’d need 130 participants in each condition to have 80% power to reject the null of d = 0 in NHST). We see you always need a bit more people to reject a meaningful effect, than to reject the null for the same meaningful effect. Remember that since TOST can be performed based on Cohen’s d, you can use it in meta-analyses as well (Rogers, Howard, & Vessey, 1993). This is a great place to use EHT and reject a small effect (e.g., d = 0.2, or even d = 0.1), for which you need quite a lot of observations (i.e., 517, or even 2069). Equivalence testing has many benefits. It fixes the dichotomous nature of NHST. You can now 1) reject the null, and fail to reject the null of equivalence (there is probably something, of the size you find meaningful), 2) reject the null, and reject the null of equivalence (there is something, but it is not large enough to be meaningful, 3) fail to reject the null, and reject the null of equivalence (the effect is smaller than anything you find meaningful), and 4) fail to reject the null, and fail to reject the null of equivalence (undetermined: you don’t have enough data to say there is an effect, and you don’t have enough data to say there is a lack of a meaningful effect). These four situations are visualized below. There are several papers throughout the scientific disciplines telling us to use equivalence testing. I’m definitely not the first. But in my experience, the trick to get people to use better statistical approaches is to make it easy to do so. I’ll work on a manuscript that tries to make these tests easy to use (if you read this post this far, and work for a journal that might be interested in this, drop me a line – I’ll throw in an easy to use spreadsheet just for you). Thinking about meaningful effects in terms of standardized effect sizes and being able to perform these test based on summary statistics might just do the trick. Try it. Rogers, J. L., Howard, K. I., & Vessey, J. T. (1993). Using significance tests to evaluate equivalence between two experimental groups. Psychological Bulletin, 113(3), 553. Schuirmann, D. J. (1987). A comparison of the two one-sided tests procedure and the power approach for assessing the equivalence of average bioavailability. Journal of Pharmacokinetics and Biopharmaceutics, 15(6), 657–680. The R-code that was part of this blog post is temporarily unavailable as I move it to a formal R package.